After the success of Century Motorsport’s number 43 BMW M4 GT4 at the last round of British GT at Silverstone, Century regular – Aleksander Schjerpen – felt gutted to be saying goodbye to the team and the car that had just brought him his first win of the season. He had only signed up for half of the championship though, so a new driver was in position, ready to step in and hopefully continue the great success that Schjerpen and teammate Jack Mitchell had started. The driver signing with Century for the remainder of the season is Dean ‘Deano’ Macdonald. At only 17 years of age, one could be mistaken that this young Scottish chap lacks in experience, but Macdonald’s involvement in racing dates back to his first Birthday, when his Dad bought him his first kart. He went on to become the youngest winner of the Scottish Championship in Comer Cadet (Karting) at eight years old and won further championships including the MSA British Comer Cadet Championship at the age of 11, with previous winners of that title including British Motorsport icons Lewis Hamilton and Paul Di Resta. 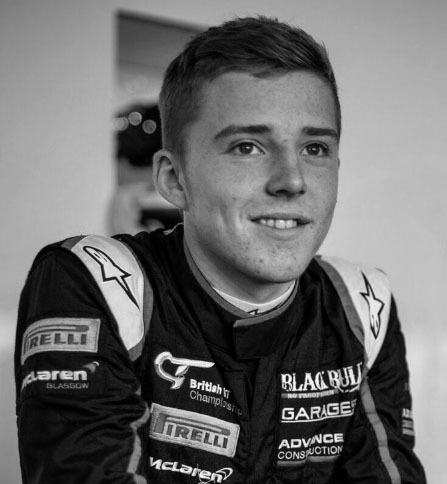 Fast-forward a few years to 2017, where Macdonald became one of the youngest ever drivers to race in British GT at the age of 16. Century are thrilled to welcome Macdonald to the team and with the Silverstone victory putting them in contention for the Championship Winner’s title, Macdonald has joined the team at a very exciting time. Macdonald will make his debut with Century Motorsport at Spa-Francorchamps in Belgium this weekend – the annual event that encompasses SRO Speed Week and is free for all visitors. Then on 4th – 5th August, the penultimate round will be held at Brands Hatch, with the final round taking place at Donington Park on 22nd – 23rd September. “I am very pleased to be part of the Century Motorsport team and very excited to see how the rest of the season will go. It is going to be great to work with such a well-established team for the rest of the year and to also partner Jack Mitchell. “It’s a real shame that Aleks could not continue the season. I’m so happy that we got a win at the last round with him and I hope we see him back in the near future. Dean is someone who we have had one eye on for some time, and when the opportunity came up to work with him, we jumped at the chance. We have a test arranged before Spa for him to acclimatise. We know the BMW is good, the team are working well and Jack is a great co-driver. All the ingredients are there for Dean to slip into his role nicely and fight for results straight away.